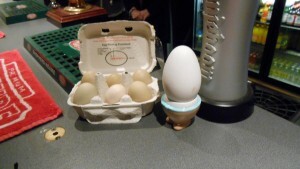 Photo of Val’s special fresh goose egg brought in to Farnborough Jazz Club (the night of Mike Barry’s Uptown Gang) on 23rd April 2015. We thought it was a wopper!. Photo by Mike Witt. Back to Mike Barry’s Uptown Gang, my first choice of song to mention was sung by Mike, ‘Blow My Baby Back To Me’ and on came the dancers immediately. I jotted down great solo trombone from ‘Whispering’ Mike. Next came Stan Kenton’s hit ‘Harlem Folk Dance’, with absolutely brilliant playing by all of them, in particular, fabulous playing from Roger on bass and Graham (C) on drums. About a dozen of us managed to dance our line-dance to a Latin American rhythm. 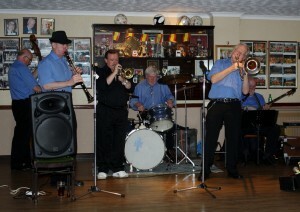 The tune was ‘Brown Skinned Girl’, great fun, thanks boys, you played it fabulously for us. Then Goff sang ‘Saving All My Love For You’. So many musicians have great jazz voices, as he has. Did you choose to sing this song because of the composer (could he be a relative Goff?) ‘My Monday’s Date’ followed on with Goff on tenor sax and fab bass from Roger (I noticed an interjection from you of ‘Fascinating Rhythm’ – see these little things don’t go unnoticed – ha). Graham was featured next and performed his own Boogie composition (obviously named ‘Graham’s Boogie’) which he played last time they were with us. Mike told me then, Graham composed it that night? Next came ‘Whispering’ Mike, singing (as well as performing a super bit of trombone playing) to ‘Wrap Your Troubles in Dreams’, (a Bing Crosby hit) to which Graham (B) also performed a great piano solo to. We did a second line-dance to ‘I Found A New Baby’, well they were playing it brilliantly. 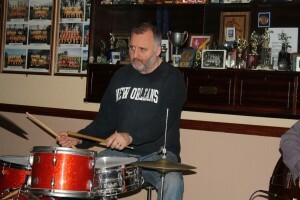 What happened next, shows how much relaxed fun occurs at jazz evenings. Mike hiccupped at the beginning of his intro with ‘Bugle Boy March’ – hiccupped? Well, he couldn’t get it right and so took a couple of stabs at it, with so much heckling from us audience in his ears. 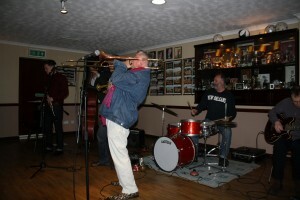 Then after another re-try, got it perfect to a huge cheer – lovely bit of fun – that’s jazz. Mike is back again on 26th June with his Yerba Buena Celebration Band, so put it in your diaries. This entry was posted in Mike Barry's Uptown Gang on April 21, 2015 by Diane. 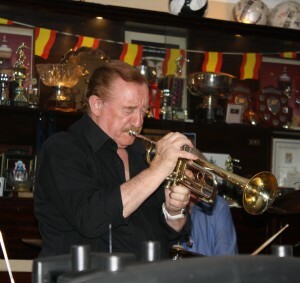 GEORGE ‘KID’ TIDIMAN’S ALL STARS’ returned to play for us on Friday, 17th April 2015 at our FARNBOROUGH JAZZ CLUB. 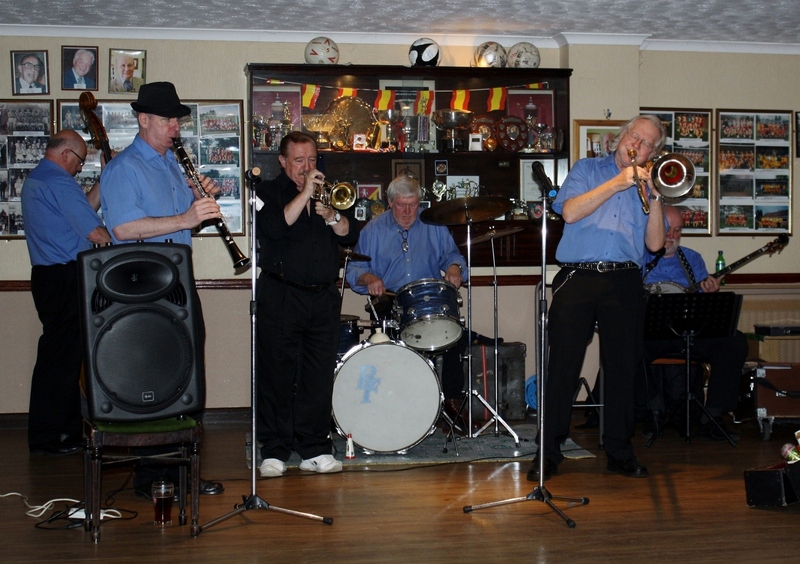 The stars with George were DENNY ILETT on trumpet, TIM HUSKISSON on clarinet, ‘SOUTHEND BOB’ ALLBUT on banjo, JOHN SIRETT on double bass and BILL FINCH on drums. It was another evening of tons of fun and wonderful music. Our ‘Kid’ was on true form, with his jokes, great trombone playing and singing, he is top notch. George ‘Kid’ Tidiman’s with his ‘All Stars’ at Farnborough Jazz Club, Kent, UK on Friday 17th April 2015. Photo by Mike Witt. But then they are all top notch. Not their first number, but they played ‘Maybe It’s Because I’m a Londoner’, I’m sure because it will be St. George’s Day on Thursday). Bob sang it, plus I’m not sure how, but believe me, George seemed to make his trombone sound like it had a cockney accent – ha! 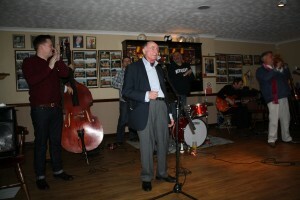 Tim Huskisson (clt), George ‘Kid’ Tidiman& Denny Ilett in ‘George ‘Kid’ Tidiman’s All Stars’ at Farnborough Jazz Club, Kent, UK Fri 17th April 2015. Photo by Mike Witt. 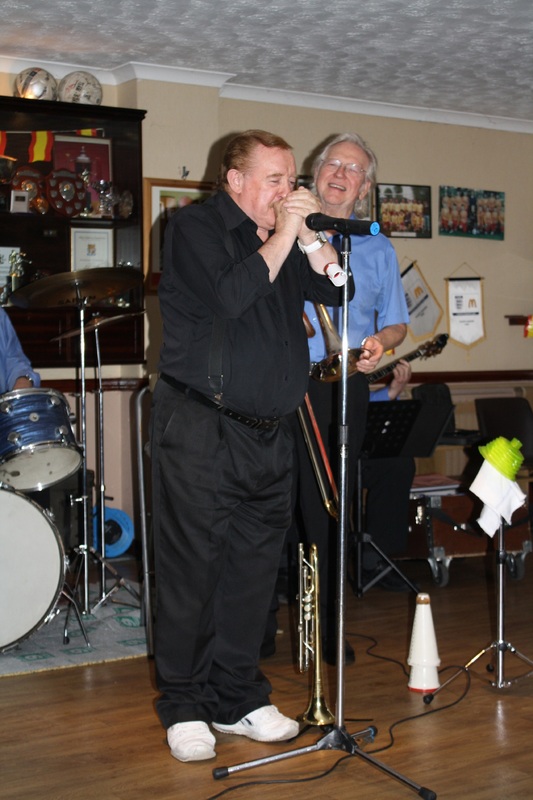 Denny Ilett with George ‘Kid’ Tidiman’s ‘All Stars’ at Farnborough Jazz Club, Kent, UK Friday 17th April 2015. Photo by Mike Witt. ‘Perdido Street Blues’ came next and what can anyone say about Denny, magnificent and ‘WOW’. 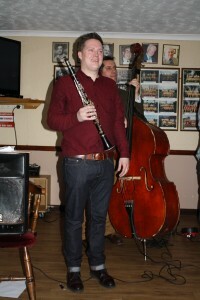 Fabulous clarinet from Tim too (who was also fabulous on piano last week because he is another talented musician too!). George practiced his tonsils on ‘A Kiss to Build a Dream on’, such a lovely song George. 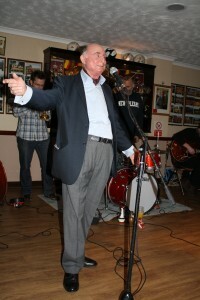 Then Bob, also with his super jazz voice, sang ‘I Thank You Mr Moon’. What followed on was so exciting, a Louis Armstrong number, ‘Hotter Than That’ (written by Louis’ wife, Lil Hardin). 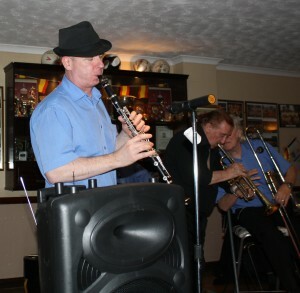 They all played brilliantly, with obviously Denny excelling himself (it’s a number I shall ask them to play again when they are next here – 31st July). Then as if it couldn’t get any better, Denny followed on with an amazing solo intro to ‘Do You Know What It Means to Miss New Orleans’. What a marvellous engine with John, Bill and ‘Southend Bob’ too, with George singing. 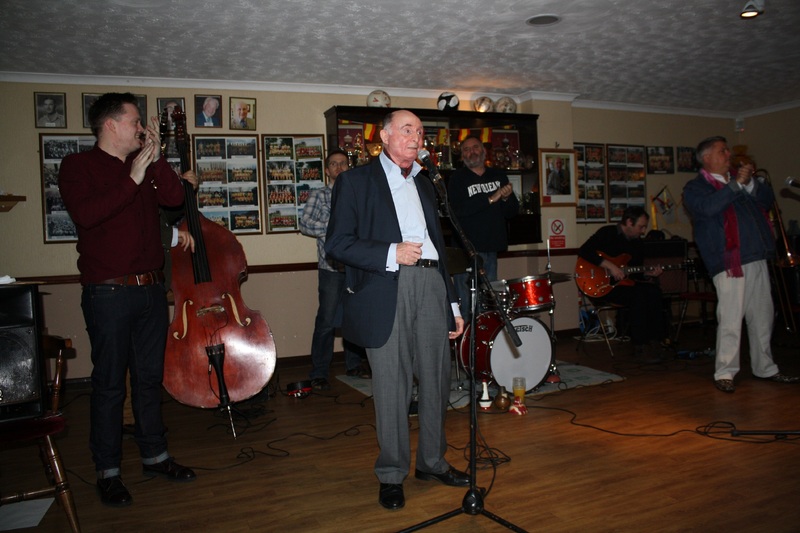 John Siret (d.bass) with ‘George ‘Kid’ Tidiman’s All Stars’ at Farnborough Jazz Club, Kent, UK Friday 17th April 2015. Photo by Mike Witt. 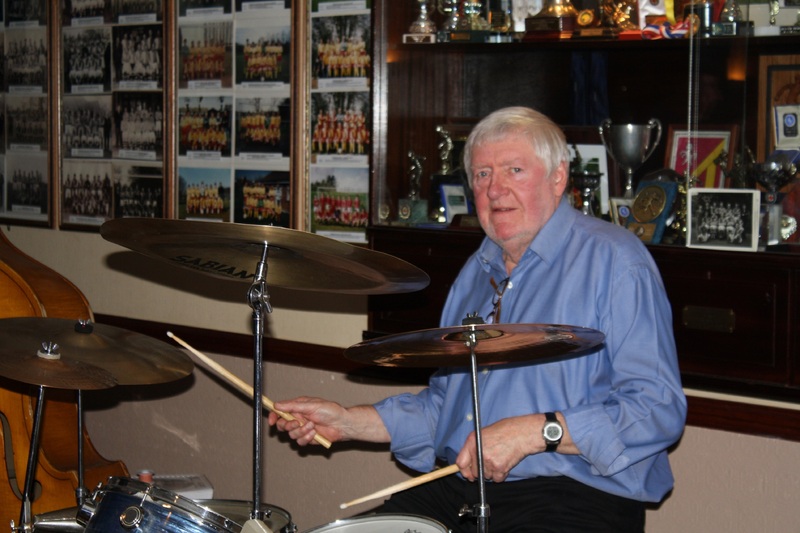 Bill Finch, drummer with ‘George ‘Kid’ Tidiman’s All Stars’ at Farnborough Jazz Club, Kent, UK Friday 17th April 2015. Photo by Mike Witt. 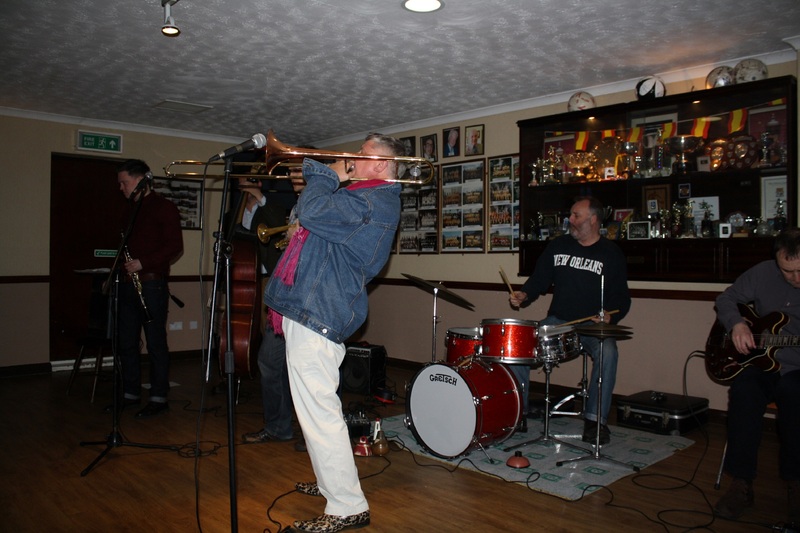 ‘Southend Bob’ Allbut with ‘George ‘Kid’ Tidiman’s All Stars’ at Farnborough Jazz Club, Kent, UK Friday 17th April 2015. Photo by Mike Witt. Brilliant Denny Ilett plays his trumpet mouthpiece with George ‘Kid’ Tidiman’s All Stars at Farnborough Jazz Club, Kent 17th April 2015. Photo by Mike Witt. but paying particular mention to Denny who performed a tremendous solo, playing just on his mouth piece. I know other trumpeters have done the same, but Denny – well he was mind-blowing, because the number is such a fast number and Denny didn’t stop. I think you must realise that I think he is a little special? See how important it is to support ‘live’ jazz, if you weren’t in the club this week, what a shame, because you missed so much! Oh well, be there next time aye! We wont be here for ever, so support us now! P.S. You must type in ‘George Tidiman’s All Stars, 6/09/2013′ in our ‘search’ box. I have just read it myself. It was my first newsletter, after obtaining my new laptop. You may recall my computer was nobbled by a virus, so no newsletters for probably a year. Keith & I have just enjoyed ourselves, being taken back to that day in September, as if it was a couple of months ago. I’m sure you will enjoy it too. This entry was posted in George 'Kid' Tidiman's All Stars on April 20, 2015 by Diane. 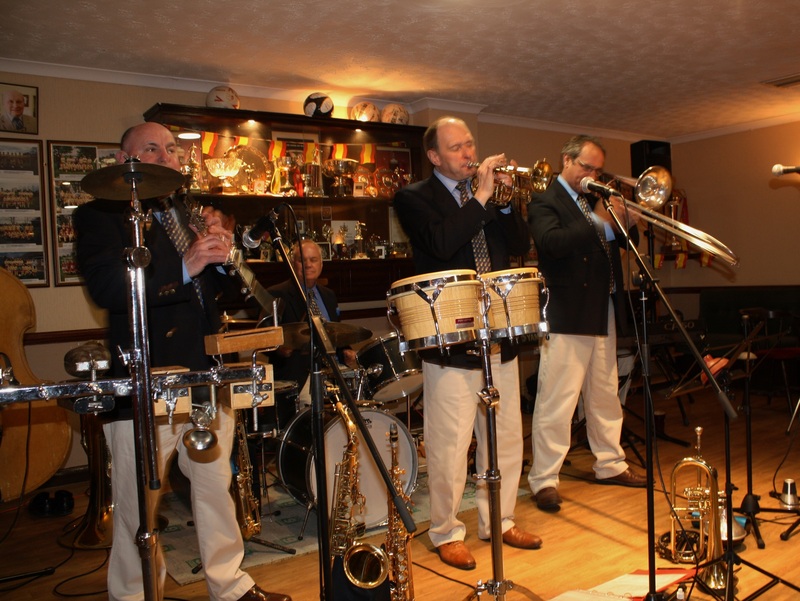 The MARDI GRAS JAZZBAND played here on Friday, 10th April 2015 at our Farnborough Jazz Club (Kent). 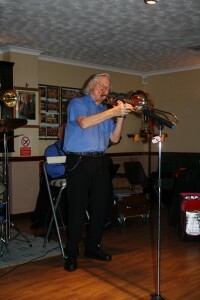 Led by trombonist ROB PEARCE, was LEIGH HENSON (trumpet & vocals), JOHN ELLMER (on everything), TIM HUSKISSON (piano), plus BRIAN BELL (drums) and ROGER GRAHAM (d. bass & tuba). They began their repertoire straight in with ‘Big Better and Egg Man’ (which was written for Louis Armstrong) and was played with such excitement. Rob then explained I had spelt his name wrong, so wanted to sing especially for me ‘Dinah’, sung by Leigh, ha. What dry humour, quite piercing of course Rob!! They played Benny Goodman’s hit number next, ‘Clarinet Marmalade’ (John played the wood bar and bongos drums). What a brilliant number and I just loved it. Next was a great Peggy Lee number ‘Lady is a Tramp’, sung by Leigh, who has a super voice. Such a difference to the last number and again another change to the following one, ’Rocking’ Chair’, sang by John – another great voice too. 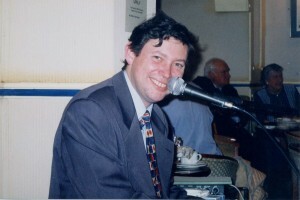 Steve Morgans (pianist) a member of Mardi Gras Jazz Band until he died back in 2001 (aged 37yrs). ‘When I take My Sugar to Tea’, was dedicated to pianist Steve Morgans, who died in 2001 at the young age of 37yrs. John used alto sax, Roger tuba and Leigh sang, such a lovely tribute. 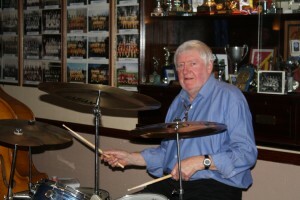 Brian began the next number with a dazzling bit of solo drumming to ‘It Don’t Mean a Thing (If You Ain’t got that Swing)’. Rob was tremendous on trombone, Leigh terrific on trumpet, Tim perfect on piano, John played brilliant bongos and Roger played beautiful bass, hmmm. One of my favourite numbers of the evening was ‘Tequila’, John played what the band call his “Fisher Price Play Station” ha. 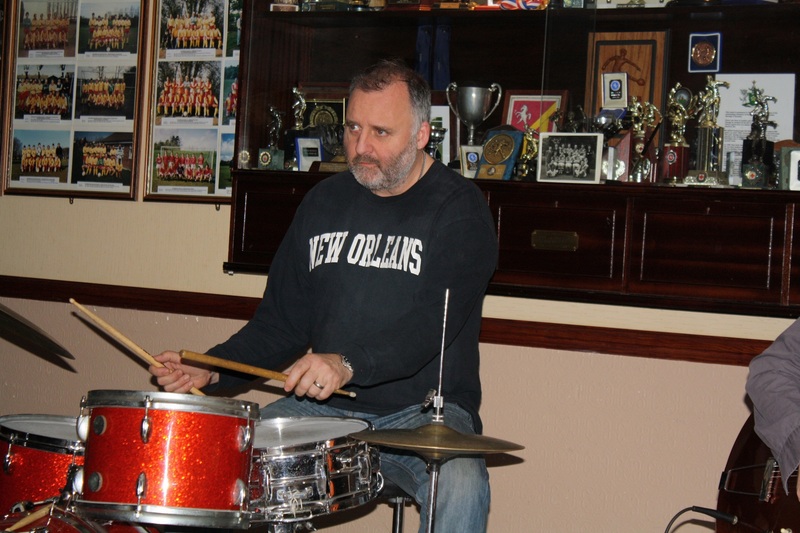 Certainly he is so talented – as most of you know, John is not only a super reed player (playing the clarinet and all the Saxes), but a master at the drums too. Just so exciting and I so wanted to dance, (but no partner at that point). Mike had a technical hitch with the photographs this week and only managed to send one, although he wasn’t happy with the result of the one, but at least you can see John’s toys. Sorry your cymbal is in front of your face John. Had there been more, I wouldn’t have published this one. Closing, I must mention last November, you yelled for us to ‘get them back please’. After this week, you have asked for them again. Now you have to wait till 21st August, but the wait, I think you will agree, will be worth it. This entry was posted in Mardi Gras JazzBand on April 15, 2015 by Diane. 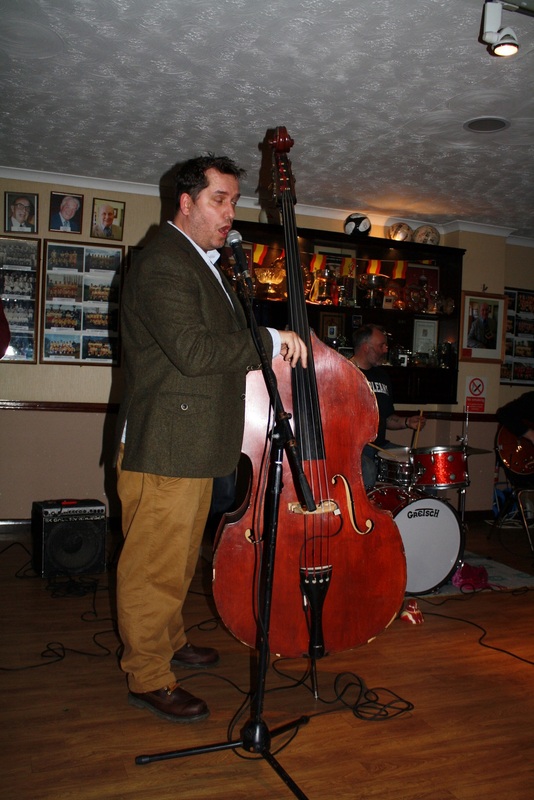 Ben Martyn, (d.bass) of Martyn Brothers at Farnborough Jazz Club, Kent on 3rd April 2015. Photo by Mike Witt. Martyn Brothers Jazz Band. 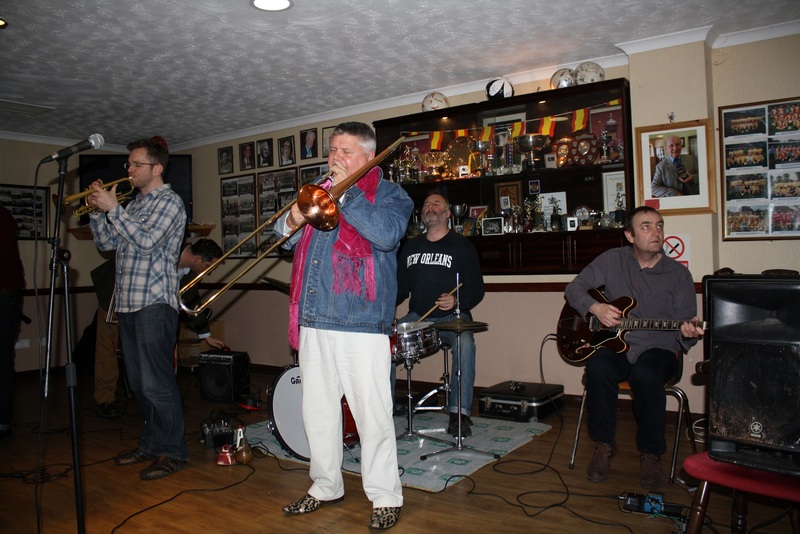 Ben & Emile Martyn (d.bass & drums), Alan Beechey (trumpet), Jeff Williams (trombone), Adrian Cox (clarinet), & JOHN ‘flashback radio’ RUSCOE (guitar) at Farnborough Jazz Club, Kent on 3rd April 2015. Photo by Mike Witt. Yes, we opened on Easter Good Friday, 3rd April 2015 although we were worried, having received so many phone calls, to say many of you were going away on your Easter break. However, we had that talented young bunch of musicians who make up the ‘MARTYN BROTHERS JAZZ BAND’ and were pleasantly surprised by a large appreciative audience. BEN MARTYN (d.bass &vocals) and EMILE MARTYN (drums) were joined by ALLEN BEECHEY (trumpet), JEFF WILLIAMS (trombone) and JOHN ‘flashback radio’ RUSCOE (guitar). Unfortunately, JULIAN WEBSTER GREAVES had been taken ill and was unable to make the gig. 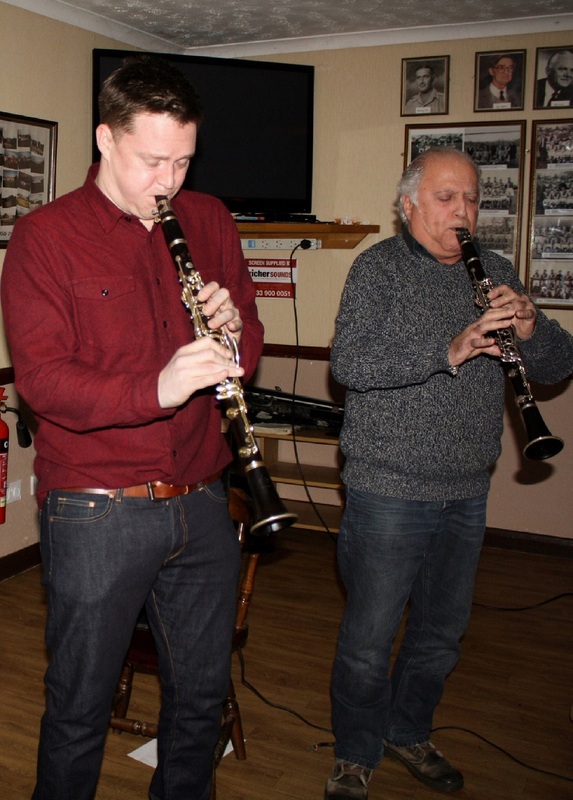 But what came out of that upset, was a wonderful bit of excitement to add to the Martyn Magic – the magic of ADRIAN COX (clarinet). Allen Beechey (trumpet) with Martyn Brothers at Farnborough Jazz Club, Kent on 3rd April 2015. Photo by Mike Witt. Adrian Cox (clarinet) enjoys guesting with Martyn Brothers at Farnborough Jazz Club, Kent on 3rd April 2015. Photo by Mike Witt. What better way could we start the Easter Holidays? They began the evening with ’St. James’ Infirmary’ and Jeff sang, plus he played a mean trombone too and wow, what a wonderful blast from all of them. 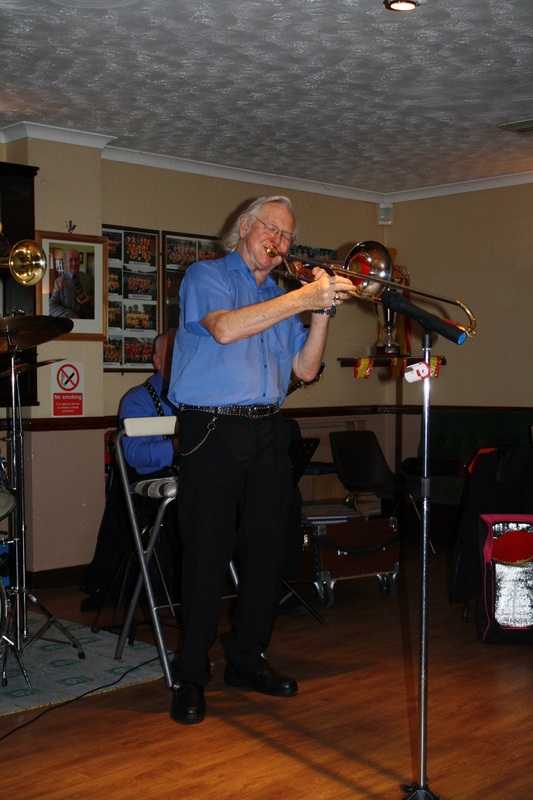 Jeff followed on with singing a Ruth Etting number, ‘All of Me’, what a great jazz voice he has – strong. I must also tell you about the fabulous magic they produced with ‘St. Louis Blues’, especially Adrian, well they were all superb. Ben sang ‘Shaking That Thing’, which brought on the dancers (I don’t think there were many people left off the floor either!). It was then we were given a lovely Easter treat, with the band asking for ‘Brown Ale Pete’ (Peter Marr) to join them and sing, it was the first we knew Pete could do so and he chose to sing Bing Crosby’s ‘Easter Parade’ (Did you see the film that morning? Fabulous). Thanks for this Pete, you were great. Peter Marr stars, singing ‘Easter Parade’ with Martyn Brothers. Ben & Emile Martyn (d.bass & drums), Alan Beechey (trumpet), Jeff Williams (trombone), Adrian Cox (clarinet), & JOHN ‘flashback radio’ RUSCOE (guitar) at Farnborough Jazz Club, Kent on 3rd April 2015. Photo by Mike Witt. The next number I wish to mention is ‘South of the Border (Down Mexico Way)’ (super guitar John) What a happy song. (I learnt it got to No: 1 spot for Gene Autrey and the composer wrote over 2K songs – including ‘Cokey, Cokey’!) Now to tell you what an exciting drum solo was to follow. Keith was over the moon and couldn’t give enough praise to Emile, the number was ‘Hesitating Blues’. Keith said it is extremely difficult to perform a drum solo to a slow tempo tune, but Emile did it! Next, well I think they know ‘Cheek To Cheek’ is somewhat of a favorite of the club, so they just had to play it again for us, and so we performed our line-dance. 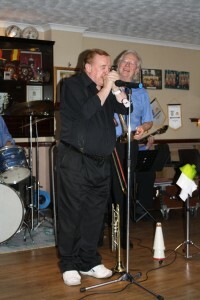 Their old friend, Norman Grodentz, also joined them on clarinet for their next number ‘Bourbon Street Parade’. Adrian gave us a song and they all played with such excitement, just simply brilliant (gotta mention Allen in particular). 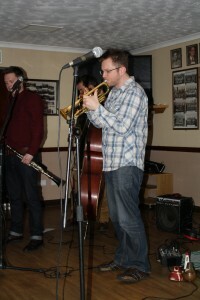 Martyn Brothers Jazz Band. Ben & Emile Martyn (d.bass & drums), Alan Beechey (trumpet), Jeff Williams (trumpet -note his famous boots- tap picture for close-up) ,Adrian Cox (clarinet), & JOHN ‘flashback radio’ RUSCOE (guitar) at Farnborough Jazz Club, Kent on 3rd April 2015. Photo by Mike Witt. Adrian Cox and Norman Grodentz (clarinets) with Martyn Brothers at Farnborough Jazz Club, Kent on 3rd April 2015. Photo by Mike Witt. 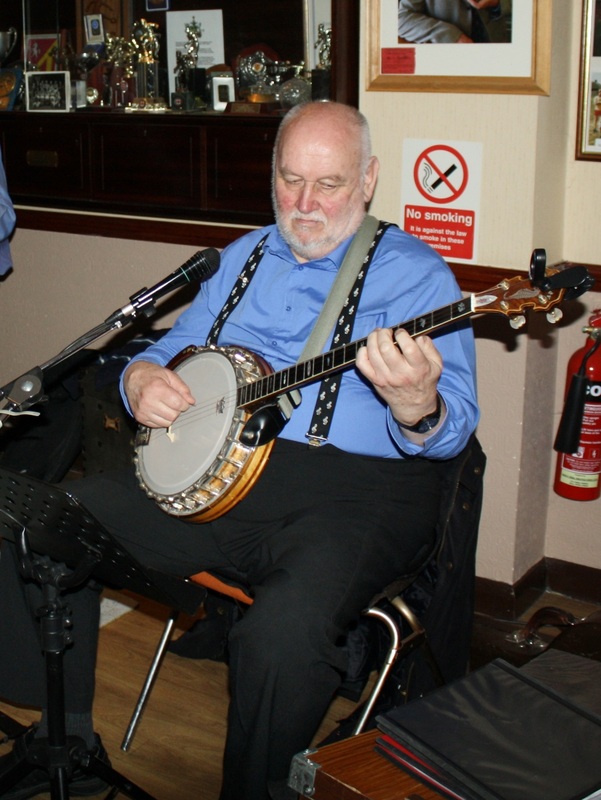 This entry was posted in Martyn Brothers Jazz Band on April 7, 2015 by Diane.